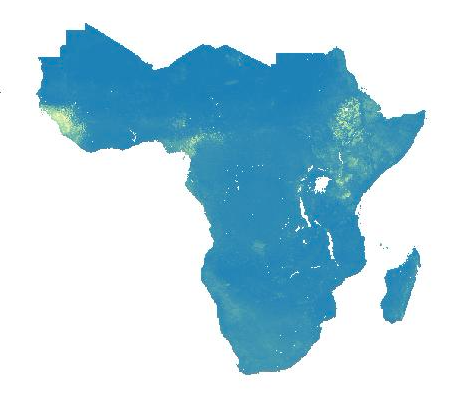 Total Phosphorus (P) content of the soil fine earth fraction in mg/kg (ppm) as measured according to unspecified analytical methods and spatially predicted for 0-30 cm depth interval at 250 m spatial resolution across sub-Saharan Africa using Machine Learning (ensemble between random forest and gradient boosting) using soil data from the Africa Soil Profiles database (AfSP) compiled by AfSIS and recent soil data newly collected by AfSIS in partnership with EthioSIS (Ethiopia), GhaSIS (Ghana) and NiSIS (Nigeria as made possible by OCP Africa and IITA), combined with soil data as made available by Wageningen University and Research, IFDC, VitalSigns, University of California and the OneAcreFund. [Values M = mean value predicted]. For details see below for peer reviewed paper (T. Hengl, J.G.B. Leenaars, K.D. Shepherd, M.G. Walsh, G.B.M. Heuvelink, Tekalign Mamo, H. Tilahun, E. Berkhout, M. Cooper, E. Fegraus, I. Wheeler, N.A. Kwabena, 2017. Soil nutrient maps of Sub-Saharan Africa: assessment of soil nutrient content at 250 m spatial resolution using machine learning. Nutriënt Cycling in Agroecosystems 109(1): 77-102). Maps produced for the Environmental Assessment Agency (PBL), funded by the Netherlands government, in collaboration with the AfSIS and the Vital Signs projects. f72f5698-4a3d-4af2-ae12-a4b1cf151cec Access to the portal Read here the full details and access to the data.